What would I say? | This is important. What would I say? Something you think when posting on social media sites, when offering up your opinion about something in the news, and now, the name of an app that emerged from HackPrinceton just a few days ago. So popular the server intermittently goes down, forcing you to access a cached copy of the site or not be able to post automatically to facebook (instead screenshotting the page to share), it was created by Pawel, Vicky, Ugne, Daniel, Harvey, Edward, Alex, and Baxter. However, they didn’t win anything there (per HackPrinceton’s Facebook event). But now their creation has gone viral. Their creation has been profiled on the Huffington Post, with an article titled, “Your Facebook Statuses are Gibberish. Here’s Proof.“, as well as Slate and BusinessInsider. Even the New Yorker has profiled the app (revealing that Baxter, is in fact, a dog). But what is so appealing about this app? Friends and I have already used the app, and we’ve all been delighted to discover something that nonsensically “understands” us, by spitting our own words back at us. Others have had the same reaction, posting about it with #wwis or #whatwouldisay, noting how the robot just “gets” them. And I think he has a point. The most appealing thing about the app is that it is our own words–something about it seems familiar, as though we’re meeting ourselves as bots. A bot that spits our own words back at us is our favorite bot, perhaps even beating out the now retired horse_ebooks. 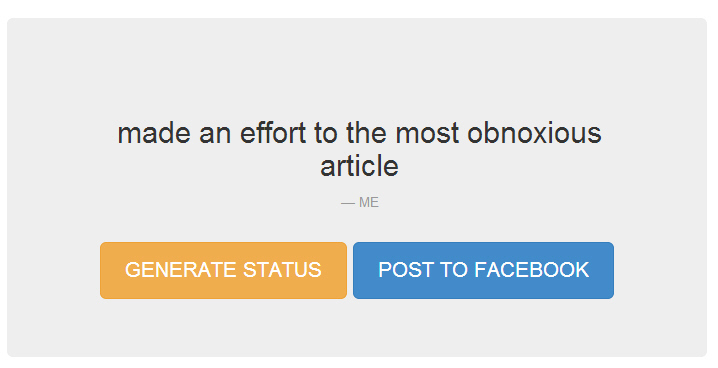 “what would i say?” automatically generates Facebook posts that sound like you! Technically speaking, it trains a Markov Bot based on mixture model of bigram and unigram probabilities derived from your past post history. Don’t worry, we don’t store any of your personal information anywhere. In fact, we don’t even have a database! All computations are done client side, so only your browser ever sees your post history. And, well, I guess I’m an upper middle class white STRIPES. If everybody would die. Thank you, weather. Here’s hoping to click without squinting. As statistics accumulate, algorithms as abstract, technical achievements, but a lot tomorrow. Some of these were actual statuses, while many of them in the short, fragmented language, are emblematic of the fact that much of what I post to Facebook are reactions to links, with short introductory phrases. Others get a bit more existentialist, or dystopian about the future (sorry, Toronto). What is most revealing is that some of these are things I would say (or have said), but many of them are just gibberish. But they all evoke some form of emotion, whether it’s a phrase that resonates with me, or perhaps assuages me: I gotta realize, I also may make it. It’s hopeful, in it’s own way. But perhaps this WWIS bot IS the bot we were hoping for–it isn’t human, but it is ourselves. It’s poetic, nonsensical, and when it comes down to it, it’s accurate. But it doesn’t know us. It knows the “us” we choose to reveal to the world, it generates a new Narrative of Bits and Pieces, using a bot rather than human intuition or impressions. It tells us our own story, back to us. So instead of us choosing what we’re going to say, we let the bot choose–what would I say? What would my public self, my socially mediated self, choose to share with my friends?